HomeSQL Server : How can you say It’s memory pressure? SQL Server : How can you say It’s memory pressure? Today, I will talk a little bit about memory troubleshooting. Even though It’s a new world of 64-bit systems but there are still so may systems on 32-bit hardware , sometimes due to operations criticality and sometimes due to investment constraints. So, I think the blog will add some value to the SQL community. I am sure you might have read lots of blog about memory and for people who haven’t – don’t worry I am going to share the links. First of all it’s very important to understand what is 32-bit system and what is 64-bit system. I have seen many people are still confused with this concept. The above video will give you a little bit of understanding with respect to the SQL server on 32-bit system. If you are looking for more information about this, please feel free to post the comment – I will be more than happy to answer the questions. Here are the few clarifications which I want to make before I move into troubleshooting of memory issues. 1. when do I use memory from Bpool and when from MTL? The answer is simple, when I need memory allocation of 8KB I will use memory from Bpool and if the requirement is of allocation more than 8KB , I will use memory from MTL. 2. Now, you may be thinking – when I set max server memory for SQL server ; does it accommodate both of MTL and Bpool region? 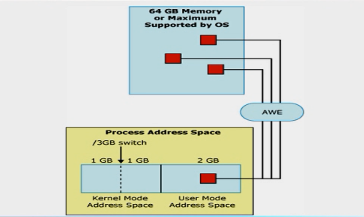 Out of 2 GB of address space 1.6 GB address space is given to Bpool and 0.4 GB is given for MTL and worker threads. Out of 0.4 GB, 128 MB (255 worker thread * 512 KB stack size) is given to worker threads. For more information, please check the above mentioned video or the blog by Jonathan :- http://sqlblog.com/blogs/jonathan_kehayias/archive/2009/07/07/understanding-the-vas-reservation-aka-memtoleave-in-sql-server.aspx. As we have very limited VAS for MTL region, we land into problems when we have CLR, Extended stored procedure , linked servers and backups etc. as they take memory from MTL region. Now, questions arises – How can you say it’s memory pressure? SQL server will throw error message in error log file along with the DBCC memorystatus output in almost every case of memory pressure i.e. whenever it’s not able to allocate memory. Main issue is to identify is whether it’s MTL pressure or Bpool pressure. Before we get into that, we need to be aware of what’s external memory pressure and what’s internal memory pressure? Well, to understand that there is a very nice article by Slava Oks :- http://blogs.msdn.com/b/slavao/archive/2005/02/01/364523.aspx. In the above article, there is a very nice explanation of what kind of memory pressures are there and how they are handled by OS/SQL. Now, we are clear with the basics to understand the context of the blog. Moving to the next phase of memory issues which we face on 32-bit systems. The below error is a generic one, which we can ignore for a moment. We will see this error whenever there is a memory pressure – be it Bpool or MTL. 2010-07-07 08:09:00.71 spid67 Error: 701, Severity: 17, State: 123. 2010-07-07 08:09:00.71 spid67 There is insufficient system memory in resource pool ‘default’ to run this query. We always have to look for the first error e.g. 2012-06-26 08:16:04.31 spid14s Error: 701, Severity: 17, State: 123. 2012-06-26 08:16:04.31 spid14s There is insufficient system memory to run this query. 2012-06-26 08:16:04.31 spid12s Error: 802, Severity: 17, State: 11. 2012-06-26 08:16:04.31 spid12s There is insufficient memory available in the buffer pool. 2012-06-26 08:16:04.31 spid92 Error: 701, Severity: 17, State: 123. 2012-06-26 08:16:04.31 spid92 There is insufficient system memory in resource pool ‘internal’ to run this query. In the above snippet, we can see that the main issue is FAIL_VIRTUAL_RESERVE 1048576 and rest are the logs which may help to troubleshoot the actual issue. When we see Fail_page_allocation, it can be from Bpool or MTL. So, based on the number of pages requested we will find out the size in this case it’s 2272*8KB which comes out to be 18 MB approx. And as the size is more than 8KB so, MTL. These are the 2 major error messages which you see for MTL pressure. Now, the question is how to fix it? 1. As we know by default 256 MB is used for MTL region’s address space and sometimes, it’s genuine usage by SQL server which can be due to linked server,backups,CLR etc. In these scenarios, it’s alright to add –g384(or –g512 if max server memory for SQL is below 16 GB – based on experience and not any official recommendation) switch in SQL server startup parameter. This switch will basically make the MTL region to increase by 128 MB i.e. from 256 MB to 384 MB. It will help to bigger the playground of the components. But the point to be noted is , the process address space is still 2GB and the 128 MB address space will be taken from Bpool’s 1.6 GB address space. you will need to add the queries in a job and run them and check at what time the max free size KB drops and so on. Try to move those dlls out of SQL address space and see if that helps to resolve the issue. 2. To find out the leak , you will need help from MS.
60-70% of the cases get resolved by setting –g384/512 trace flag and remaining ones need some work. There is one very common error which we see for the Bpool memory pressure: FAIL_PAGE_ALLOCATION 1 . It’s for one page i.e. 8 KB. This is sometimes fairly simple and sometimes it can be tricky. When we see this sort of issue, we have to hunt for a memoryclerk /Cachestore / userstore which is consuming highest amount of memory. There is no thumb rule for any clerk that if uses some x amount of memory then it’s consuming over expected amount of memory. The playground for Bpool consumer is 1.6 GB of address space and for data and index pages – we have the solution of enabling AWE. But for the stolen pages, we still have limited space of 1.6 GB minus some address space for AWE pages. Most of the times the issue happens for the stolen pages. FYI : – Data and index pages a.k.a hashed pages and any other allocation from Bpool except hashed pages are known as stolen pages e.g. allocation for locks, execution plans etc. is being consumed by service broker. SinglePage Allocator 733608 <- 732 MB approx. OBJECTSTORE_LBSS is used to store temporary LOBs – variables, parameters, intermediate results of expressions. This is also used in parser code for storing metadata expression objects and for loading Stats blob during compilations. In this case, there was a stored procedure which was using TVP and was working on LOB data was found to be the culprit. The above examples were just to give you an idea how we troubleshoot the Bpool issues. Similarly , there can be any memoryclerk /Cachestore / userstore which may be culprit. we have to understant their purpose from the article :- http://support.microsoft.com/kb/907877 and try to find out the cause of the issue. Memory node Id = 64 KB => NODE 64: This is usually the DAC Node. Can ignore it in this case.